The fit of the Drafter jacket is quite a bit more relaxed than many of the other models from Scorpion which typically are more sport oriented. We tried the size Medium in this jacket on Huey and we put an XL jacket on Dewey. These are the sizes they normally wear and both were a pretty roomy fit. Take a look at our close-up pictures and you can see this. My advice would be to wear the size you normally wear in men’s clothing, and if you are between sizes and/or prefer a more snug fit, then choose smaller. You can also use the chart below to choose a size based upon your chest and/or belly/waist measurements. I added an estimated “max belly” measurement too. Like I said above, this is a relaxed style so most people won’t have trouble with the belly size (like they might with a trim sport style), but if you have a bit of a belly it wouldn’t hurt to put a tape around it and make sure you are OK with the size you’ve chosen. I measured the Medium at a max chest of about 43” and the XL at about 48”, which confirms our assessment that the jackets fit about one size large. The taper on the jackets is slight… only a few inches, so belly sizes should not be a problem for most (examples: the Med has a max belly of about 41” and the XL is about 44”). The jackets have a pretty good waist adjustment system so you will be able to tailor the fit through the waist. Again the jacket fit roomy as compared to this chart so if you are between sizes, choose the smaller. 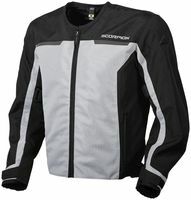 The Scorpion Drafter II jacket, as the name implies, is an updated version of their original Drafter. What’s new/different? Well, the styling for one. I always liked the original Drafter, but the graphic with the little triangle pointing down looked kind of funny to me, and in my eyes this new updated version looks a lot better. Also, the removable windproof liner is now included rather than being an optional item. Functionally, you’ll appreciate this jacket mostly for hot weather. About 75% of the outer shell is a full mesh material that will allow air to blow right through. Other areas are made of a solid textile material, but there really isn’t enough of the solid material to significantly restrict flow. You can see this by taking a look at our gallery of close-up pictures… just take the “View Larger Images” link above. Like other jacket styles from Scorpion, the quality of this jacket is very good. The tailoring is very nice and the materials are very good quality. This jacket has all the basic features you’ll need in a summer-specific jacket. It includes the armor in the shoulders, elbows and back. The shoulder and elbow armor is standard CE armor which is robust. The back pad is simple foam and might be fine for most people, but if you want better protection for the back, an energy absorbing, and thicker version is available below. Other features…. pockets in front and one inside for storage of your personal items. The jacket does come with a removable wind liner which is common with full mesh jackets like this. The liner will help keep you warm if the temps drop a bit on your trip, like a cool morning for instance. The liner will also be handy if it rains lightly. While it is not “waterproof” it will help shed some light rain… certainly better than nothing at all. Also, check out our pics of the nighttime reflectives… WOW! They are as good as any jacket I’ve seen. They really light up!